FertaFlow is made from fresh fish carefully processed at low temperatures to maintain the integrity of naturally occurring amino acids, vitamins, hormones and enzymes. 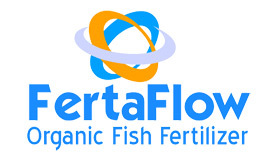 FertaFlow fish hydrolysate contain the natural oils and proteins of fish, which break down slowly becoming available to soil microbes over a longer period of time than chemical fertilizers or fish emulsions. The majority of fish fertilizers on the market today are known as emulsions. Meaning the fish is cooked and the oil removed for industrial chemicals. Also the protein is removed and dried to make fish meal for livestock feeds. The remaining waste is condensed into a thick liquid called an “emulsion”. FertaFlow is cold processed to retain the living organisms therein and retains all the natural oils and proteins nature originally provided. FertaFlow is made from a unique source of fresh fish. The enzymatic process used takes natures protein and makes it readily absorbable for plant leaves and roots. FertaFlow provides all the nutrients you would expect from fish without the unpleasant smell. FertaFlow will promote beautiful flowers, lush green lawns and turf, and delicious fruits and vegetables. Promotes the growth of soil microorganisms. Will not stripe or burn. Efficient for use with spray or drip irrigation systems.